Back in December I got my first haircut in Berlin. This made it around four months since my last haircut, and for me that is quite a while to wait. I had put it off for a number of reasons: being intimidated to speak German with the barber, not knowing what kind of barbershop I wanted and feeling like I didn’t have time to go. There were probably a few other reasons as well. Rather than finding an English barbershop or a traditional German one (which would have helped me practice my German), I got my haircut at a Turkish one. My reasons for doing so are related to the concept of Gospel-Centeredness. The first reason has to do with how I spend my money. One of my values is to keep it as local to where I live as possible. I never really incorporated this value into my purchasing decisions when I lived in the Baltimore suburbs or the outskirts of York City. But after moving into the city of Berlin and having a regular income, I knew that I wanted to make sure my money was invested for the good of Berlin—and even more so for the Kiez (neighborhood) where I live. So whenever there is something I need or want to buy, I look first to see if it can be found in Berlin and preferably in the district where I live, Neukölln. It is sometimes difficult to resist the urge to buy things from Amazon.de, especially when there are no Targets or Walmarts. But I believe this is important for seeking the “peace and prosperity” of the city, as Jeremiah 29 talks about. My situation is, of course, different than that of the Israelites in Jeremiah; unlike them I chose to live and work in Berlin. But I believe the principle is the same. The other reason is simply to get to know people and build relationships in my neighborhood. If you don’t know anything about Neukölln (aside from being trendy), it is also heavily Turkish-influenced. Berlin has the largest Turkish population in the world outside of Turkey and Neukölln really bears that out. Imbisse, döner kebap, and shisha bars line my street as well as most of the streets in the district. There are also roughly three Turkish barbershops on my street alone. The only way to engage with my neighborhood and the people in it is to get involved there, and that means going to the same places they are going to. I could easily type “Berlin English barbershop” into Google and head on up to Friedrichshain, Mitte or Charlottenburg. But then I wouldn’t really be a part of my neighborhood. I don’t think I could do that without feeling somehow superior or set apart from the people in my neighborhood. For this reason I also intentionally seek out food, cafes and other cool spots in Neukölln first. As I said earlier Neukölln is a really trendy spot in Berlin right now so this is quite easy to do. It is not like there are cool things only in Neukölln. Berlin has a lot of exciting and interesting things to do. But for me it is really important to get to know the heartbeat of my particular slice of Berlin and to be actively engaging with it. Who knows what kinds of conversations and relationships could spring out from that? So to me, an important part of being Gospel-centered is that the Gospel of Jesus shapes how I make decisions and why. The onus shifts from “How can I do what feels best for me?” to “How can I live out the two greatest commandments: Love God and love others?” It was not easy getting my hair cut from someone who spoke neither English or German. It was far from the worst experience, and I did get a good inexpensive haircut, but it was not the most comfortable place I could have gone. But for me, seeking the “peace and prosperity” of Berlin is done through local partnerships, settling in and doing what is best for those around you. 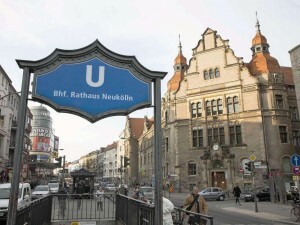 And in my case that is a vibrant, fascinating part of Berlin known as Neukölln. Perhaps others do similar things for reasons that aren’t motivated by the Gospel, and I applaud those people. But I know that for me personally, if I wasn’t seeking to live a life centered on the Gospel, then I would not be doing anything of those things. I would be seeking to live a life centered on myself. And that certainly wouldn’t give God any glory.